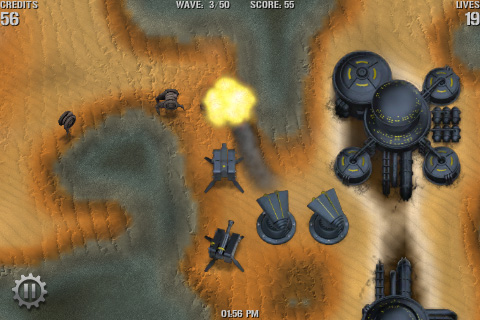 Gain control of Zorganto, fighting your way against the Bombdroids, with an arsenal of powerful towers. 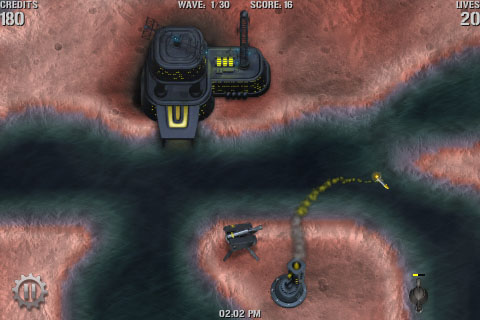 TriDefense is a new game of the towerdefense genre with a unique feature: modifiable terrain. This opens a whole new world of possible strategies to win the game. Get engaged with the challenging missions, discover new strategies to fight the new water enemies along the classic air and ground ones, but most of all, have tons of fun! 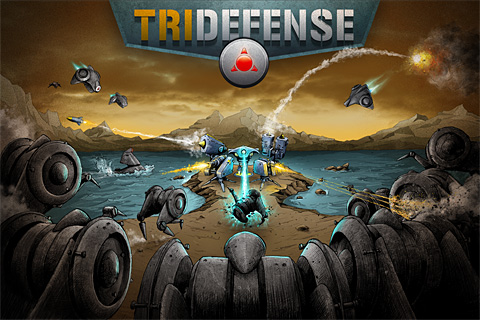 At the time we started with TriDefense there were no game toolkits and the iPhone was not that powerful, so we immediately understood that we had to build an engine and it would take some time. A couple of us were obsessed with Desktop Tower Defense at the time and there were no games like it on the recently launched AppStore, so we decided to take that basic mechanic and build upon it. Even if we suspected somebody should be working on something similar, we never saw Fieldrunners coming. At first we were devastated, but we kept pushing and in 2009 we released it. TriDefense gave us a lot of nice surprises, it won an award and was downloaded more than 700.000 times. MODIFIABLE TERRAIN: Flood the land, or build over water, creating new paths for your enemies. Use it to explore new and unique strategies. FREE PATH: Place your towers freely in the battle field, and expect your enemies coming from virtually anywhere. DIFFERENT MISSIONS: Beat your enemies in several missions, each one with unique objectives and a carefully planned terrain to challenge you. Enjoy each mission in the Rookie difficulty and get ready for the Expert! 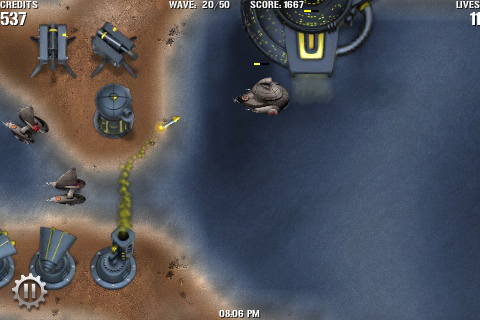 THREE KINDS OF ENEMIES: Besides the ground and air enemies available in most TD games, fight the new water enemies. Look out for the smart enemies too. TOWER ARSENAL: Deploy your 18-strong tower arsenal, each one with multiple upgrade paths. POSITIONAL AUDIO: Use your ear to know where the enemies are coming from! 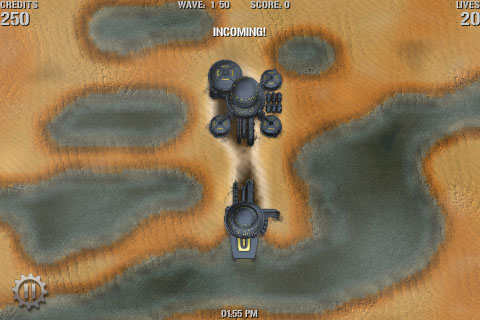 SURVIVAL MODE: Play any mission in survival mode and see how many waves can you resist. 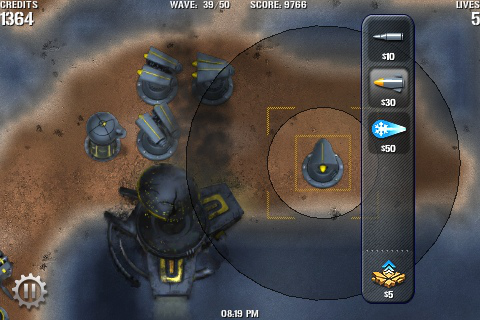 "The toughest and most challenging tower defense game for the iPhone, hands down." 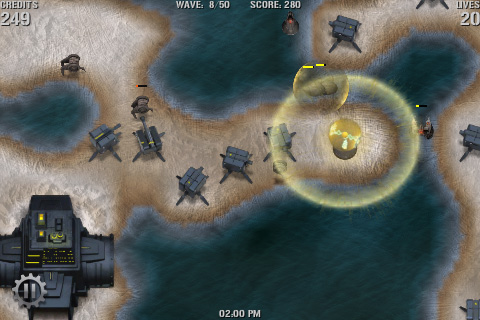 "If you enjoy tower defense games then I’m confident you will like TriDefense and should give it a go." "… un investissement justifié pour un titre qui vous divertira pendant de nombreuses heures. (TriDefense version 1.0)"
"Definitivamente o jogo é muito bom…"
"Les meilleurs Tower Defense sur iPhone"
"Après l’avoir testé je peux vous assurer que celui-ci dispose d’un énorme potentiel […]"
"[…] TriDefense, un jeu Tower Defense-like avec une petite fonction sympa qui vous permet d’éditer les terrains du jeu." "Encore un tower defense ? Oui, mais TriDefense semble apporter un certain nombre de fonctionnalités intéressantes à un genre qui se répète rapidement."